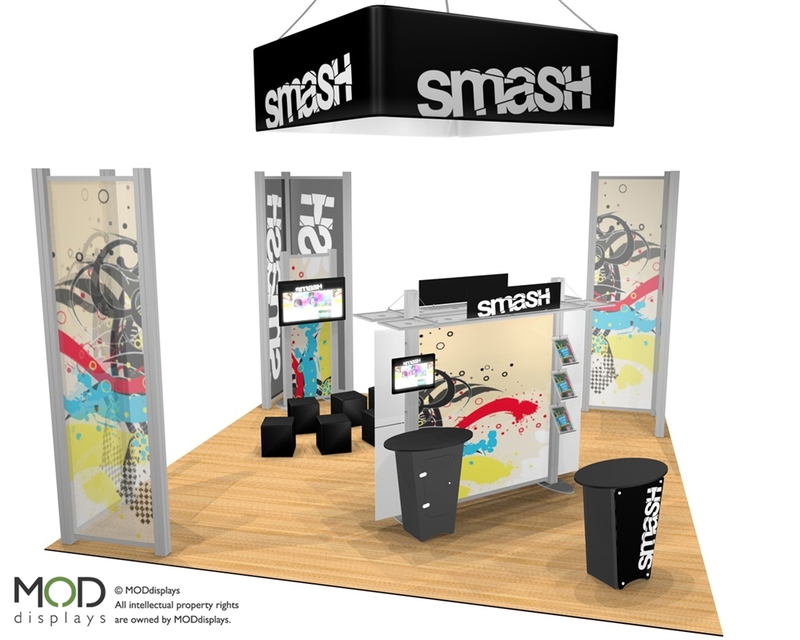 With a custom-modular extrusion based system, the visionary XVline trade show display system combines a tool-less assembly with both fabric and rigid-substrate graphics. Contact us for custom needs. The XVline 2020.03 trade show exhibit features towering backlit panels, clear panes, brushed aluminum pillars, and a 20x20 hanging sign. 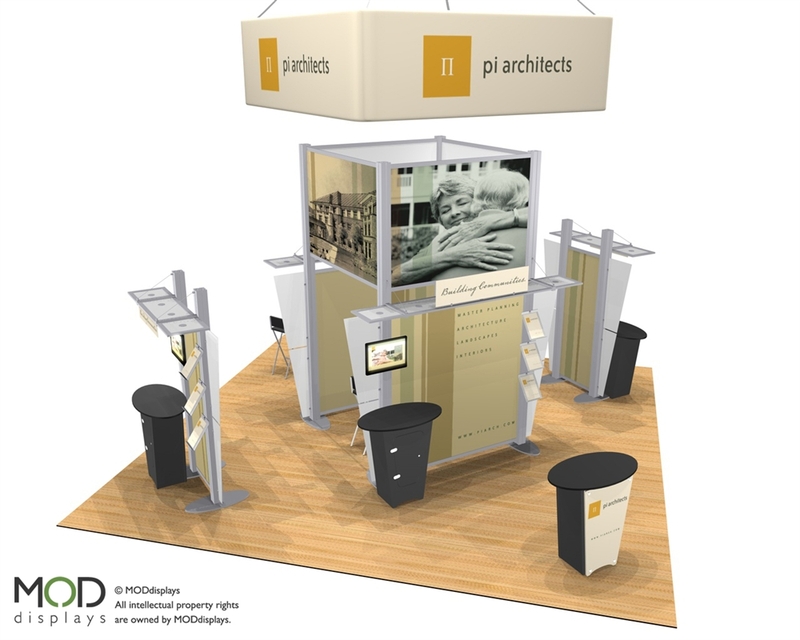 The distinctive layout provides an open floor plan for a variety of configurations furniture, literature stands, kiosks, and more. The XVline 2020.04 trade show exhibit is a beautifully designed configuration featuring numerous media-ready monitor mounts, snap-on literature stands, locking counters, a geometric tower with a variety of panels for creating visual interest. Additional customization available. The XVline 2020.01 features a semi-private, central meeting space, media-ready monitor mounts, a variety of locking counters, and info stations. The hanging sign complements the header graphic space and provides a space for bold messaging. Additional customization available. 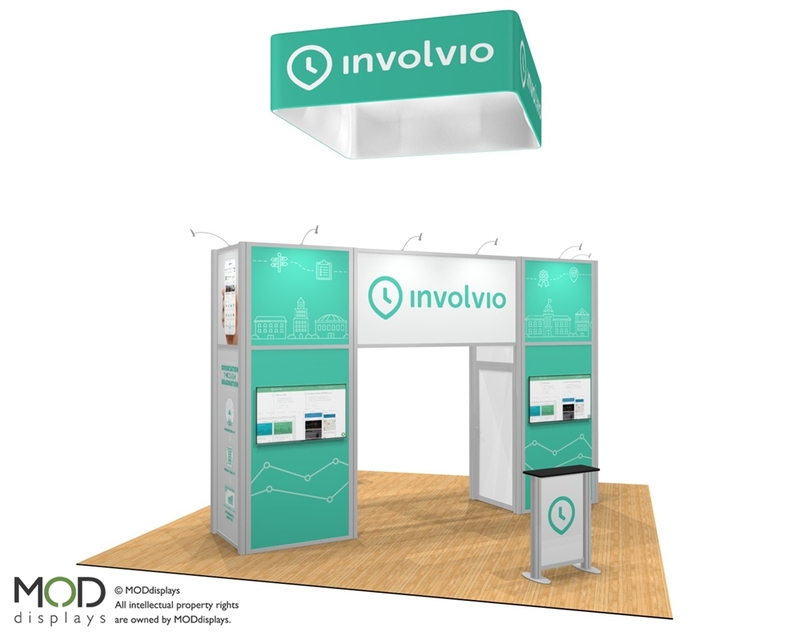 The XVline 2020.05 trade show exhibit is a bold design featuring two towering, curved displays, info counters, locking counters, literature stands, media-ready monitor mounts and a dual circular hanging sign. Additional customization available. The XVline 2020.07 trade show exhibit is ideal for island or peninsula configurations. The towering yet open back panels provide a grandiose feel to this open booth layout. The hanging sign mimics the curve of the backwall and info counter. Also featured media-ready monitor mounts. 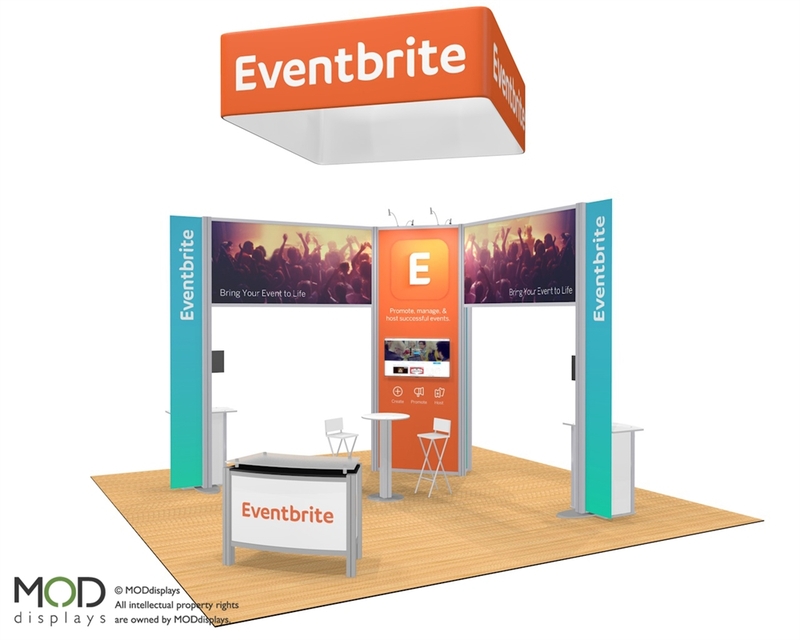 The XVline trade show exhibit is a highly versatile option for anyone seeking display units that can be reconfigured based on a variety of booth sizes. 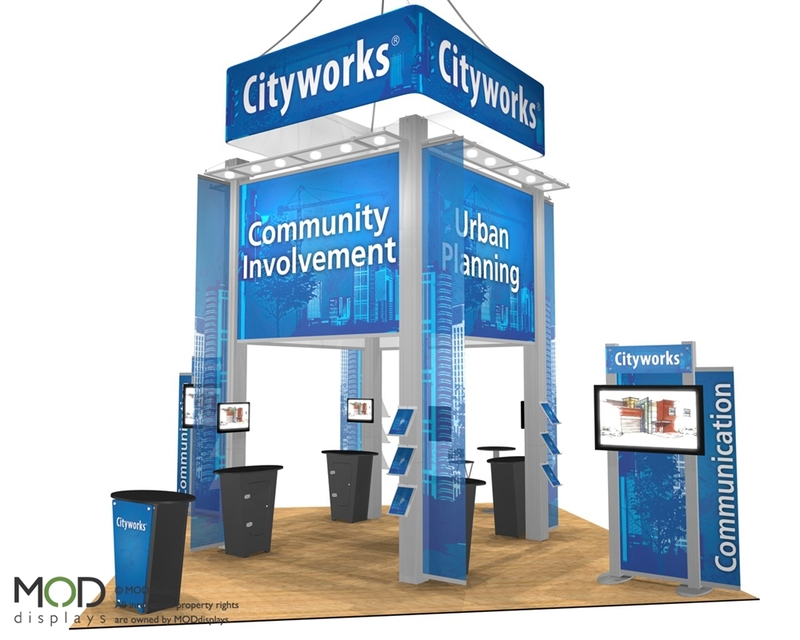 This exhibit features three towering display panels, square hanging sign, info center, media-ready monitor mounts, and locking counters. The XVline 2020.06 trade show exhibit offers a completely private conference room, multiple media-ready monitor mounts, hanging sign, and a relatively small footprint allowing for versatility in booth placement. Additional customization available. 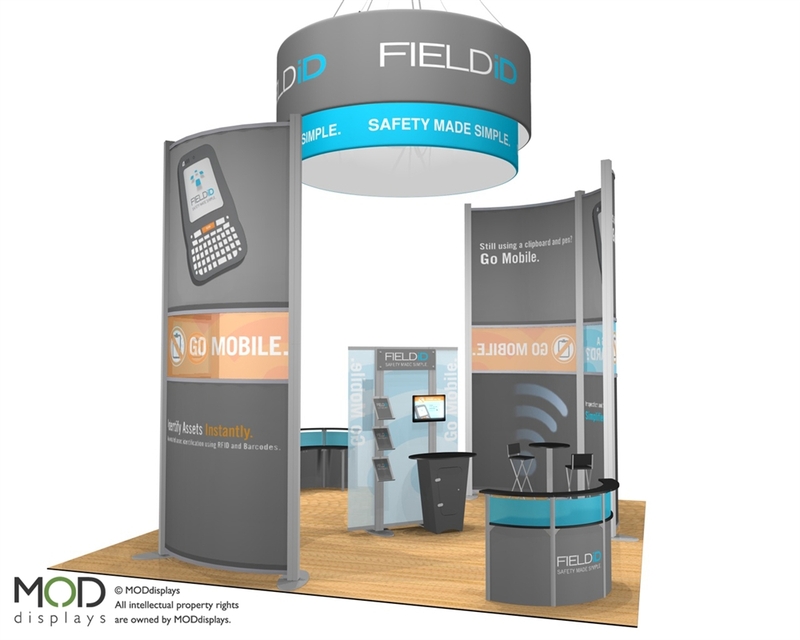 The XVline 2020.08 modular trade show exhibit is an open format booth layout featuring meeting space, info counter, multiple media-ready monitor mounts, and hanging sign. The connected panels provide an open design with distinctive panels. Additional customization available. 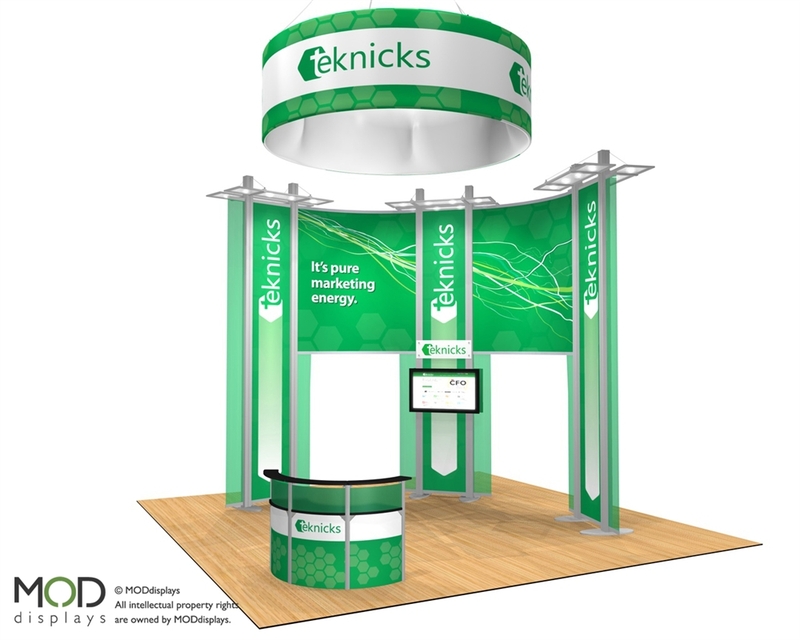 We love to meet our clients' exact needs, so please feel free to take a look at these pre-designed 20' x 20' custom exhibit kits, and envision combinations or customization you'd like to see. Call us at 877.663.3976 for a custom rendering and proposal. 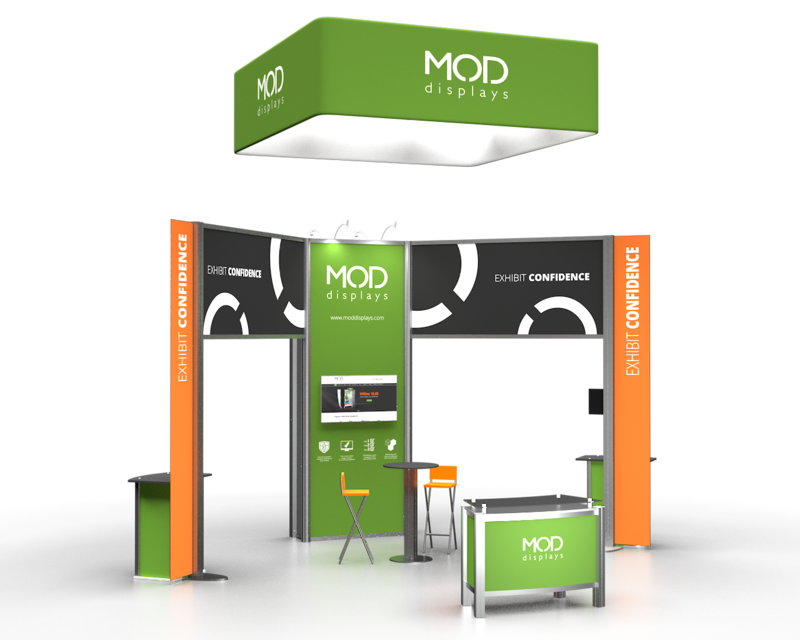 This state-of-the-art modular display provides tool-less assembly within a highly customizable system. The frame is made of aluminum extrusions, which permits extensive accessorizing including monitor mounts, shelves, slatwalls, literature racks, ipad kiosks, counters, and more. 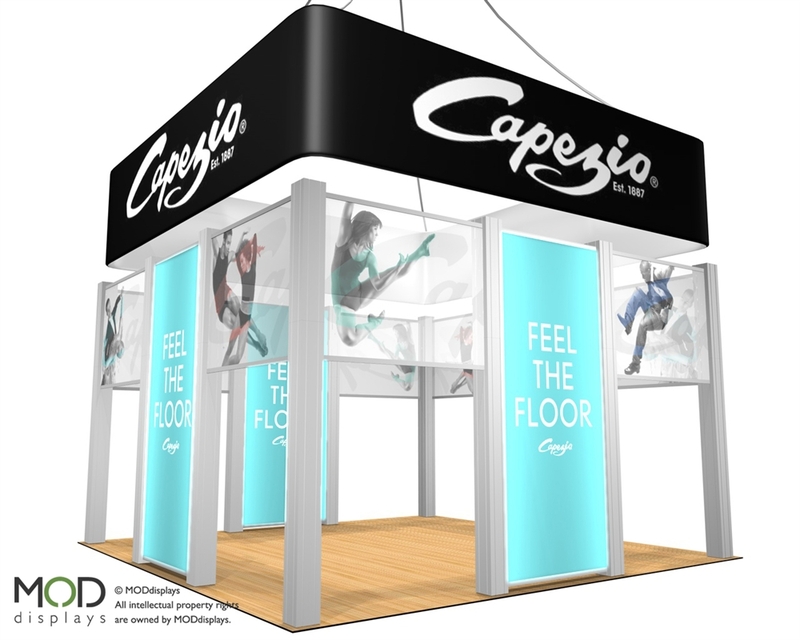 Both fabric backwall and rigid-substrate graphics are available. Modern accents include translucent, opaque, and custom printed panels, wings, and headers.